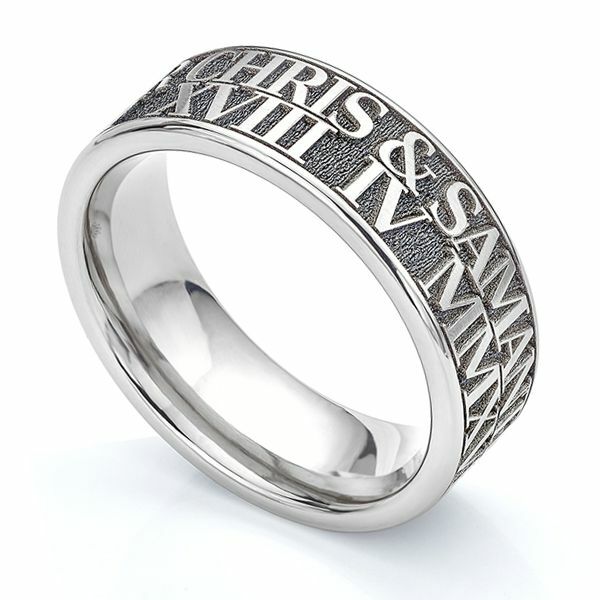 Crafted in durable Titanium, this unique wedding ring design features highly personalised engraving. Once your order is placed, we will contact you to discuss your engraving requirements. Your engraving wraps around the Titanium Wedding Ring in raised relief for a truly unique and sentimental effect. The ring design benefits from a mirror polished edge and interior surface which can be further personalised. The 8mm width allows two rows of text to be applied by a process of precision laser engraving. We present your completed ring, beautifully presented in Serendipity packaging, hand delivered by secure courier to your door in time for your big day. Please allow 2-3 weeks for your ring to be made. Further help and guidance is available if you have further questions on this or on any other ring design.